The Brezza estate, which includes part of the renowned Cannubi vineyard and other fine sites around the village of Barolo, has been bottling since 1910. Now run by Enzo Brezza and his cousin Giacomo, the fourth generation of the family to make wine here, Brezza’s wines are icons of traditional winemaking: organic grapegrowing, long macerations, and aging in large barrels. This transparent style, applied consistently and cleanly across the different bottlings, allows the differences of site to become clear, with no new oak aromas or rusticity to get in the way. These are some of the best Barolos being made. 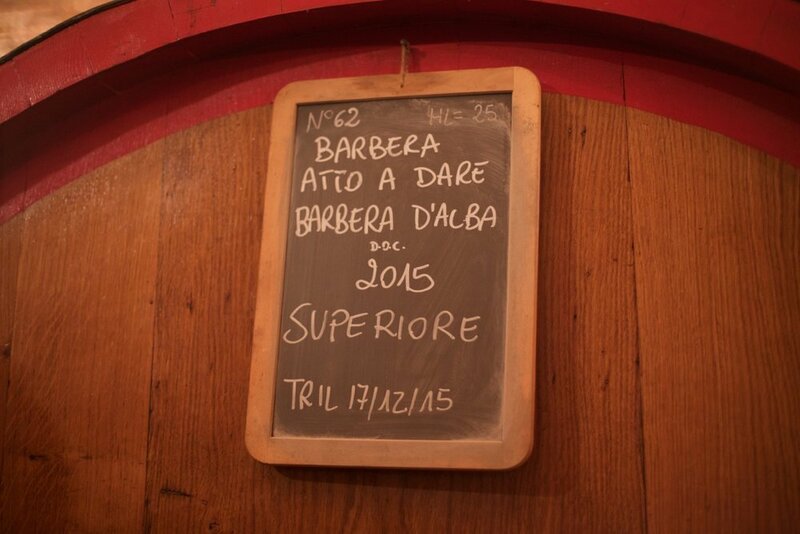 (Kerin O’Keefe, in her excellent book Barolo and Barbaresco, describes Brezza as a 'fine producer of Barolo.') Enzo Brezza also makes two everyday Nebbiolos that show the elegant, fruit-forward side of the variety. There is a range of styles of Barolo grown around the different villages that make up the whole Barolo appellation. (Barolo is both the name of the appellation and the name of one of the villages within it.) The area can be divided into two parts, the western part (including La Morra, Barolo, Verduno and Novello) where the soil is ‘calcareous marls of the Tortonian epoch which are relatively compact, fresher, and more fertile’ (Oxford Companion to Wine), producing wines that are relatively elegant, fruity, and drinkable when young; and the eastern part (Castiglione Falletto, Monforte, and Serralunga), where the soil is ‘from the Serravallian epoch, with a higher proportion of compressed sandstone, less compact, poorer, and less fertile…’ (OCW), producing wines that are firmer in structure and take longer to mature. (Castiglione is in fact on the ‘seam’ between the two types, and produces wines that are between the two styles.) The wines grown in the village of Barolo are typically more structured than those from La Morra, but less so than those from Castiglione, Monforte, and Serralunga. Grown in soil that contains a high proportion of silt and sand, this Chardonnay is fermented and aged in stainless steel. The soil gives the wine minerality, structure, and aromas of flowers and yellow fruit. I love Dolcetto, and I drink a lot of it. This is a crimson, fruity, perfumed, drinkable version of a grape that can have a fair amount of structure; drink it young, for vibrant fruit flavors balanced by a faint tealeaf dryness that makes the wine perfect with a wide range of food. Aged in stainless steel and cement tanks, no wood. This is Nebbiolo from vineyards around the village of Barolo, declassified into Langhe Nebbiolo. It’s aged only in stainless steel, and bottled in spring following the vintage; as Enzo says ‘We want this wine to represent Nebbiolo in its youth, helped by the closure (a glass stopper) and the label, which shows a poppy, the flower that in June turns our hills red and lets our imagination fly on wings of freshness.’ Lovely words, lovely wine. 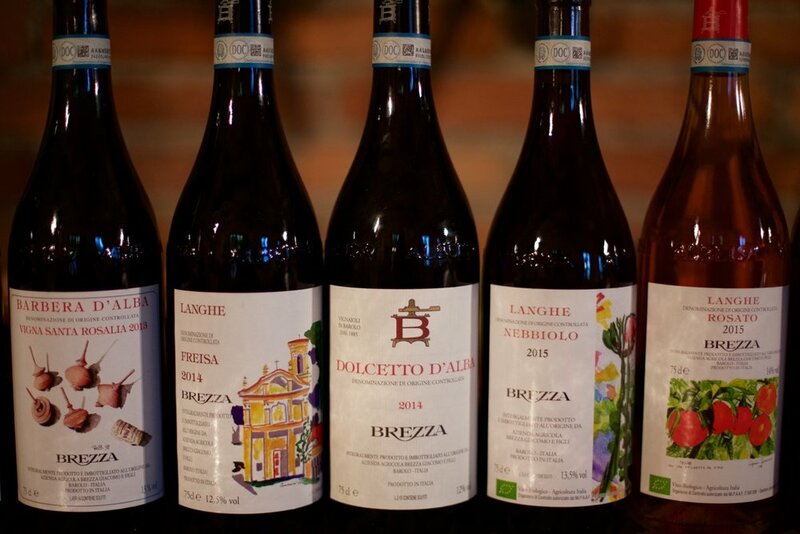 Brezza’s regular bottling of Barolo is made of fruit from estate vineyards in Novello, Monforte, and Barolo itself. It’s textbook Barolo; it’s relatively forward for the appellation, with aromas and flavors of red-currant, cherries, sandalwood, tobacco-leaf, licorice and expensive leather and an endless finish. I age this wine but you could absolutely drink it early with red meat or cheese too. Delicious is not usually a word I’d use for Barolo but this is in fact delicious. It’s made traditionally: organic grapegrowing, long macerations, aging in large barrels. The Cannubi vineyard is ‘perhaps the most historic cru in all of Barolo,’ according to Kerin O’Keefe; it’s certainly the best known. 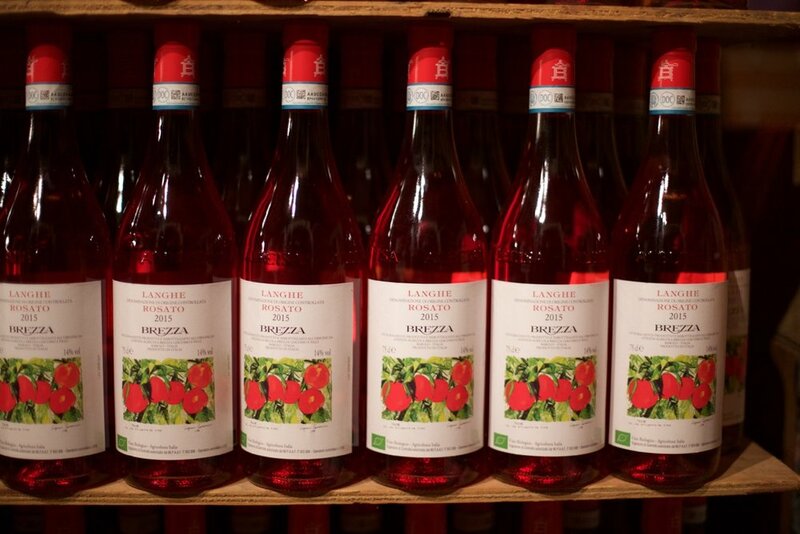 The best wines from Cannubi are perfumed, elegant in structure, complex, and distinctive, and Brezza’s bottling is a great example. For Barolo, one of the world’s most age-worthy red wines, these wines are relatively drinkable young, but they age superbly. This wine is made traditionally: organic grapegrowing, low yields, long macerations, aging in large barrels. Aromas and flavors include red currant, wild strawberry, licorice, sandalwood, and fine leather; the wine is very long, very elegant. Enzo Brezza is one of the producers (along with his cousin, Maria Teresa Mascarello), who have insisted that the Cannubi name be used only for the historic vineyard itself, and not the area around it, as other producers have suggested. The Sarmassa vineyard has more clay in the soil than Cannubi, and less sand. ‘This cru sits on the opposite side of the main Barolo ridge from Cannubi, and yet it has a distinct microclimate…it is the first area where snow melts in the winter. Altitudes range from 250 to 300 meters (820 to 980 feet), and plant ages range between twelve and seventy years old.’ The wines grown here are more structured than those from Cannubi; the vineyard is not as well known as Cannubi, but I think Brezza’s Sarmassa is outstanding. The Castellero vineyard is 'located in the village of Barolo at an altitude of 300 meters (980 feet) above sea level…enjoys southern exposures while the soil is a mixture of sand, silt, and clay, with a higher percentage of sand’ than either of the two other crus.